This image shows the site of the southern end of a pontoon bridge erected across the Thames during WW1 to aid the movement of troops. In this photo dated 1920, there appears to be a slipway in front of the Clarendon which may have been the exact point at which the southern end of the pontoon came ashore. 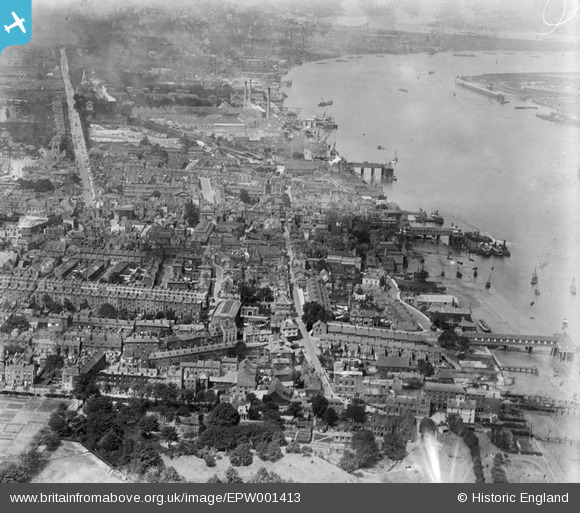 A pontoon bridge across the tidal Thames was built from Clarendon Lawn, Gravesend, to near Tilbury Fort in Essex. Information about the bridge is sparse and contradictory. The 'Discover Gravesham' council website (http://www.discovergravesham.co.uk/gravesend-chronology/1910-1916.html ) states that it was built in 1914 using 70 lighters (a shallow barge for loading and unloading ships) but was dismantled after a few months. 'Tilbury and Chadwell Memories' (http://www.tilburyandchadwellmemories.org.uk/page/the_tilbury_to_gravesend_pontoon_bridge_1915-1918 ) gives more detail and states that the pontoon was in place from 1915 to 1918, using 67 lighters. The BBC 'World War One at Home' site ( http://www.bbc.co.uk/programmes/p0232hsx ) gives dates of 15th November 1914 until the end of the war. Details provided and several images on Google show that there were two carriage ways with a total width of about 20 feet. There was also a removable section of about 600 feet to allow shipping through - the Thames was one of the busiest, if not he busiest, river for shipping in the World at this time. The Town Pier with passenger ferry service to Tilbury. Gravesend West Street station (so named between 1899 and September 1949, previously Gravesend, subsequently Gravesend West). It was opened by the London Chatham and Dover Railway in 1886. From 1916 until 1939 or 40, Batavia, a Dutch shipping line, ran a service from here to Rotterdam with a 'Continental Express' rail link to London Victoria. Tram on tram line from Gravesend to Northfleet. In the photograph only one tram line is evident. This is in the centre of the road and I expect that there would have been passing loops strategically placed along the route. From a small extract from an 1897 25" to the mile map that I have seen, one such loop was in New Road, just west of the junction with Stone Street. Tram services ended in Gravesend in 1929.